Chlamydia is the most common sexually transmitted infection in the UK. It is the most common in young people, but it also affects older people, with a growing number of people over 40 testing positive. Most people who have chlamydia will not notice any symptoms. According to research, 50% of men and 70-80% of women will be asymptomatic when infected by chlamydia. In some cases, you may show symptoms only briefly, but even if the symptoms disappear you may still have the infection and still be able to pass it on to others. If you do have symptoms, they tend to develop 1-3 weeks following initial infection, but may take longer to appear. Despite the fact that cases often will not present with symptoms, chlamydia can become serious if it isn’t diagnosed and treated early on. The risk with chlamydia is that it can lead to pelvic inflammatory disease (PID), epididymo-orchitis (inflammation of the testicles), and infertility. In rare cases it can also cause reactive arthritis, and of course there is always the danger of passing an undetected STI onto a partner. We have an experienced sexual health team who can help you get tested or treated for chlamydia quickly and accurately. Give us a call and come speak to one of our specialists today. Testing for chlamydia is quick, painless, and simple. 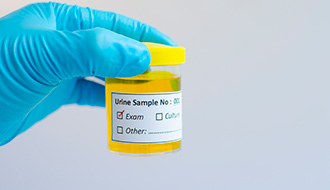 A sample of cells can be taken either by swabbing the genital area with a cotton bud, or by urinating into a container. In advance of your appointment, be sure to hold your urine for at least 2 hours. This will produce the most accurate results. How long do I need to wait before getting tested? The test will be most accurate if you wait 2 weeks after you think you may have been infected. If you are noticing symptoms, or if your partner has already been diagnosed, it is best to get tested as soon as possible. Those under 25 are at higher risk of infection, and so testing is advised for this age group either once a year, or each time you have a new sexual partner. We will be able to get your results to you within 24 hours or on the next working day.